Thank you to the original author of this article Julia Kate Swodeck for giving us permission to use her post. according to Twitter, Twitter may be used for any number of purposes, but originally it was for the purpose of connection. that lets you share and discover what’s happening now. the #christianunsocialmedia where advice is plentiful, but humanity is sparse . On the other hand, a week ago I purchased a book, Plan B, from Amazon.com and tweeted that I was looking forward to its arrival… the author, @pwilson (lead pastor @crosspoint_tv) direct messaged me & thanked me for buying his book. He even wished me a great weekend. When the book arrived I tweeted of its arrival and sure enough, @pwilson messaged me again “enjoy the book & the rain.” I can’t even begin to imagine how difficult it must be to manage tens of thousands of followers, but somehow @aplusk (Ashton Kutcher) seems to manage nearly 5,000,000 followers and still has the time to bring awareness to social causes, share wisdom, share twitpics, home videos, and even @ reply followers internationally. Here’s the point… I am not so sure that it’s okay for us to be so busy that we can’t be normal and reachable, that we can’t discreetly reveal our humanity to those that have been kind enough to click the Follow button. This is our chance as Christians to reveal our humanity to the masses. After all, within the masses are skeptics, critics, wanderers, and seekers… the harvest is plenty tweeps. So that’s that. That’s why I don’t follow Rick Warren. It’s nothing personal, I just don’t use twitter to be communicated at, but rather to communicate with. Why do you use Twitter? Are you tweeter and a listener? 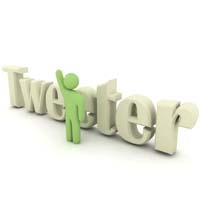 Do you think @ replies and other interaction between followees & followers is beneficial? What say you Tweeps? go to www.titherofinnovation.com to see the comment discussion, including a kind and generous reply from Pete Wilson, author of Plan B, lead pastor at Cross Point Church in Nashville.